We've all seen the MetLife blimp, emblazoned with Snoopy, floating slowly along the NYC skyline once a year every summer. Far fewer have seen the view from inside the blimp. But this month, I was lucky enough to ride along with British-born pilot Mark Finney as he steered MetLife's 20-year-old Snoopy 1 along this exact voyage. I arrived in Readington, New Jersey, at 8AM sharp for my four-hour flight, which was scheduled to begin at 9AM. Readington is home to Solberg Airport, which provides a large open field perfect for blimp and hot air balloon operation. It even hosts a massive hot air balloon festival every year. But this morning, the field was home to two blimps: The MetLife blimp and the larger DirecTV blimp, both of which sat in the middle of the airfield overnight, with crews taking turns watching over them. The day was absolutely perfect for a flight: Low wind, sun, and a few perfect clouds. During the hour before takeoff, the crew readied the blimp and ran innumerable checklists before flight. Our co-pilot for the day, Alex Orcutt, met me where I parked my car and gave me a quick safety rundown. Then he told me to follow him in to the blimp crew's location, where they have a trailer filled with tools and chairs for the crew to lounge in while waiting for blimps to complete their flights. By the time I got out of my car, the blimp was already docked on its mast and ready for take off. Mark Finney, who'd be piloting Snoopy 1 that day, was already inside—Alex ran me up to the door of the gondola, and I got in and buckled up just as they detached the blimp from the pole and backed it into the middle of the field. Before I knew it, the crew had run off and we were up in the air, arcing back toward the field for a pass over as we headed to New York City. Cruising at an average 30 miles an hour, Snoopy 1 passed over New Jersey for an hour before we got within sight of New York City. Mark gave me the rundown on what life is like for a blimp pilot working for Van Wagner Airship Group, the biggest blimp manufacturing and managing company in the US. With ten in-house pilots, Van Wagner controls and staffs the DirecTV, MetLife, Budweiser, and Horizon blimps—plus several more throughout the rest of the world. Blimp operation is mostly done through levers positioned at the feet and a wheel to the right of the pilot's seat. A throttle is positioned by the pilots left hand to control thrust, but all steering comes down to the wheel and levers. The levers control the rudders while the wheel controls the elevators. This steers the blimp left, right up or down. 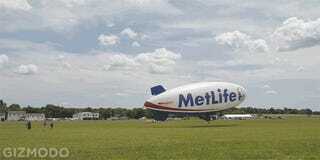 The MetLife pilots spend most of the year "chasing golf." It's exactly what it sounds like. MetLife believes its best chance of advertising is the audience that watches golf—so the blimps follow it every season, traveling across the US. They do aerial photography and get screen time in return. But during the single week when the PGA tour goes to the UK, Snoopy 1 visits New York City to do some flights down the skyline instead—hence my chance to go up in the iconic blimp. During the winter, Snoopy 1 spends its time on the West Coast and the South. Cold air and snow make it significantly more difficult for a blimp to fly. When it's time to come back east, the blimp's trip from LA to NY takes about three weeks. Being one of the smaller vessels, Snoopy 1 needs to keep an 800-1,000 foot altitude to maintain the air pressure in its 68,000-cubic foot envelope. That means it can't go over the Rockies, so instead, it goes around them: South through flat Texas and back up, all the while averaging its steady but slow 30 mile an hour pace. Snoopy 1 didn't always have a 68,000 cubic foot capacity. Over the past 20 years of its life, it's grown 10,000 cubic feet because its envelope stretched over time, though it still holds its place as the worlds smallest commercial blimp. When traveling internationally, Snoopy 1—fully deflated—can fit into a shipping container. Because it can only travel 6-8 hours on a full tank, this little blimp travels to Europe on a ship rather than by air. We finally reach the skyline a little over a hour into the trip. "This is my favorite flight," Mark tells me as he rattles off a hundred other places he's flown, including India and Switzerland. He takes us over the Verrazano Bridge and up the East River. Several helicopter pilots say hello over the radio. We loop down and spin around the Statue of Liberty. Then we're off, back to the airport. His copilot is waiting to take over for the afternoon. Landing and docking was practically as exciting as taking off: The crew essentially catches the plane by the ropes dangling off the envelope's nose cone. They attach it to the mast, and then, once we're back on solid ground, we step down out of the gondola. Alex and the crew inspect the gondola before its next flight, and once they deem it safe, he gets in and Mark assists the crew in take off. Within a few minutes, Snoopy 1 is in the air and I'm getting into my car for the drive back to Manhattan—which proves to be much faster, but nowhere near as exciting.